PROGRESSIVE EXERTION: Thomas Bey, a rider with Owens Healthcare cycling team, pushes himself during a lactate threshold test at Shasta College on Friday. 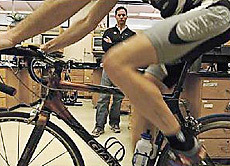 EFFICIENT POSITION: Thomas Bey pedals as Judd VanSickle, a technician at the UC Davis Sports Performance Lab, checks to see if the bike is adjusted for maximum efficiency, noting such things as saddle position and angle, handlebar position and pedal stroke. The north state cycling community got an insider's look at the Tour de France on Friday when Dr. Max Testra, director of the Sports Performance Lab at the University of California at Davis and a former team physician at cycling's premier event, talked about the race at Shasta College. His slide show addressed physiological aspects and conditioning for tour athletes. He cited some impressive figures for tour riders, such as their enormous daily fuel (food) intake of 4,500 to 8,000 calories, their low body fat composition of 8 percent or less and high ratio of power measured in watts per kilogram. Testra and his assistants also fitted some of the area's serious cyclists on their bikes and did lactate threshold testing to help the riders determine their maximum efficiency.